The CampusCoin Project’s marketing strategies are not standard or traditional. We cannot adhere to the norm. This must be something greater, unpredictable and powerful. We are speaking of a marketing model that is something closer to warfare. Perhaps even drawing influence from Sun Tzu’s Art of War, as we have engaged in a battle we know we can win. At times, you may see CampusCoin leveraging offensive and defensive flanking techniques. Promoting CMPCO at an event like the NCAA Football National Championship has not only become possible, BUT A REALITY. You heard it here first! We are humbled to announce that the CampusCoin Project will have a marketing presence at the NCAA Football National Championship game on January 8th, 2018 at Mercedes-Benz Stadium in Atlanta, Georgia. AArrow will be providing two superstar sign spinners, ranked #2 and #7 in the world respectively, who will be at the stadium performing while simultaneously promoting CampusCoin with custom-made CMPCO signs. We are thrilled to have the ability to promote CampusCoin at one of the largest collegiate sporting events worldwide. Keep an eye out for us if you’re at the game! AArrow not only gives us the ability to enter markets like the NCAA Football National Championship and other large events that draw massive international crowds, but the ability to penetrate campuses across the globe. This partnership allows for CampusCoin to have a marketing presence anywhere that a person can walk. This is crucial when it comes to infiltrating the campus marketing space worldwide, as we can be present at any school event with ease. This gives us a clear advantage over the competition as our reach is endless. 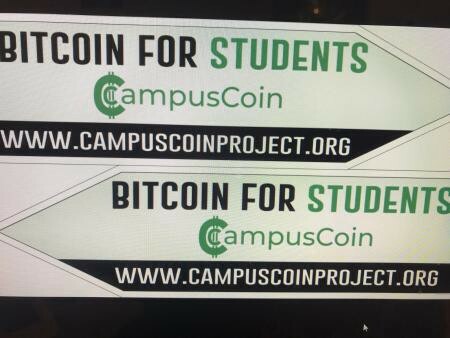 Expect to see CampusCoin at any collegiate event worldwide. AArrow and CampusCoin have similar visions which make this partnership a perfect marriage. As you know, CampusCoin aims to be used on campuses, both domestic and international, to simplify transactions and to reduce the financial stress that comes with being a student. AArrow has offices and employees located in 26 major cities across the US and in many countries located around the globe. Their employee base primarily consists of current (or recently graduated) students who are masters in the art of guerrilla marketing. Since their creation in 2002, AArrow has employed over 5000 students as sign spinners and has succeeded in helping reduce the high unemployment rate this demographic is subject too. AArrow is the force that will help push our guerrilla marketing campaign to the next level. The CampusCoin Project team is thrilled with what AArrow brings to the table, and welcomes aboard their active, competitive, and international team of marketing masters. Go to an event, and look for CampusCoin. We just may be there! To find out more information about what AArrow Sign Spinners have to offer, please visit their site here. Our community has expressed the desire for more bounties that revolve around giving away free CMPCO. We have responded! The CampusCoin Project team would like to announce the start of a one week contest that will include two separate 10,000 CMPCO rewards. These rewards will be given to the two members of our community who create the best videos for the two topics we have selected: Crypto-101 and CMPCO Wallet Tutorial. Details for this bounty can be seen below. *Videos that are well made but not selected as the winner will be rewarded 500 CMPCO for the time spent making it. We will decided which non-winning videos deserve rewarding. NOTE: Only one video for each topic will be declared the winner of the 10,000 CMPCO. Winning videos will be posted on our official site and recognition will be given to the creators. Legal Notice: Any information uploaded to CampusCoin shall be sent knowing that upon reception of this information, CampusCoin has the right to use the material in whole or in part for the expansion and betterment of CampusCoin. For any questions concerning these new bounties, please contact us. CampusCoin aims to connect all schools with a simple to use digital currency that can be accessed directly through mobile devices.